'La Fortune' (Mary Dunn, R. 1988). Seedling# M83-844B. TB, 35" (89 cm), Midseason bloom. Standards red brown; falls washed magenta in center, edged red brown; bright orange beard; ruffled. Seedling# M78-662-17: ('Charro' x ('Ponderosa' x 'Tambourine')) X 'Hilow'. MAD Gardens 1989. From AIS Bulletin #273 April 1989 Introducing LA FORTUNE (Mary Dunn '89) Big wide ruffled red blend. Standards, hafts and edge of falls mahogany red. 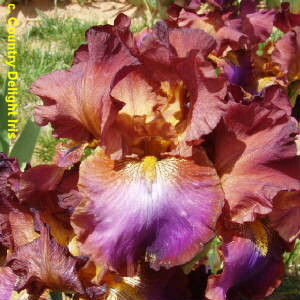 Deep violet wash in center of falls, large deep bronze beards. Heavy substance, great form, a garden showoff. Many flowers, 8-10 buds, 36". (Charro x (Ponderosa x Tambourine)) X Hilow. $35.00. M.A.D. Iris Garden.